My friends at NARAL asked me to tell you what it was like before Roe vs. Wade. They asked me to tell you what it was like to be twenty and pregnant in 1950 and when you tell your boyfriend you’re pregnant, he tells you about a friend of his in the army whose girl told him she was pregnant, so he got all his buddies to come and say, “We all fucked her, so who knows who the father is?” And he laughs at the good joke. Right now [November 2014], we need writers who know the difference between production of a market commodity and the practice of an art. Developing written material to suit sales strategies in order to maximise corporate profit and advertising revenue is not the same as responsible book publishing or authorship. Yet I see sales departments given control over editorial. I see my own publishers, in a silly panic of ignorance and greed, charging public libraries for an e-book six or seven times more than they charge customers. We just saw a profiteer try to punish a publisher for disobedience, and writers threatened by corporate fatwa. 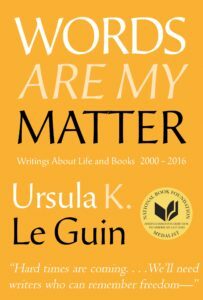 And I see a lot of us, the producers, who write the books and make the books, accepting this — letting commodity profiteers sell us like deodorant, and tell us what to publish, what to write. 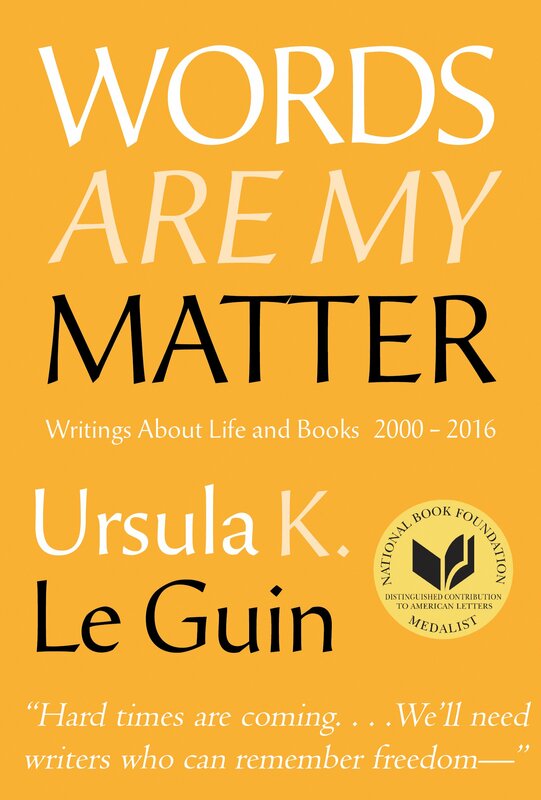 I finished reading Words Are My Matter months ago, and have found myself dipping back into it from time to time to look at something anew, or to reconsider what Le Guin said on one subject or another. Writing about it today, I have had to work hard not to settle in again and re-read large swathes of the book. What more could I ask of a collection of essays?